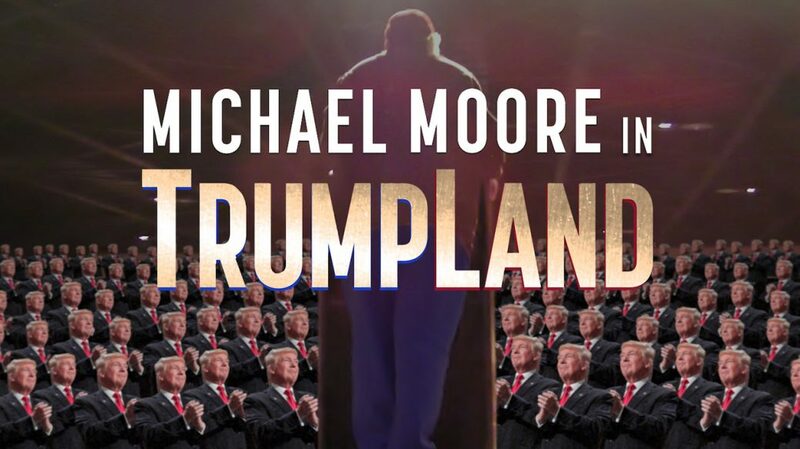 Michael Moore’s “Trumpland” begins with left elbow humor, timely anecdotes of interest, and satirical truths about the election ahead. Then, the movie dies, much like the first day of a new large lecture class where the professor’s canned opening words hold your interest until the PowerPoint slides begin. Moore worked at this; yet delivers in a casual podium stance, then part chair and the rest wandering. The beginning of the film presents outdoor town scenes with the locals, and Moore should have taken the cameras outside and remained there. What appears to be an acknowledgement and complimentary approach to Trump’s push for office turns true to Moore’s asinine methods. He spins into a pro-Hillary Clinton rant. Without noting the problems of the Clinton candidacy, Moore sympathizes toward the dumb ‘stand by her man’ lie from Little Rock to Lewinsky, falling into the ‘first woman president’ allure many women and millennials favor; whether they know past and current history or not. Moore then completes his presentation memorable of Allen Sherman’s “Hail to Thee, Fat Person,” screaming to the balcony in a classical symphony sforzando. Don’t buy this film unless you are a Michael Moore archivist. The best part of this film is the opening and that it is only one hour and twelve minutes in duration. The only thing that could have made it worse would have been a ‘My Pillow’ commercial intermission.